I did my homework before going to see Money Lab, a self-described “economic vaudeville” presented by Untitled Theater Company No. 61 at HERE. Each performance features a different collection of acts, so I looked at the long list of participating artists and selected a performance that looked like it would feature both the type of theatrical work that I’m naturally drawn towards and something that would take me in a new, unfamiliar direction. Money, after all, is a bizarre thing to talk about, simultaneously a concrete good that controls most aspects of our daily lives but also a pervasive idea founded on rules that, to me, seem mysterious and often silly. What was remarkable about Money Lab was that, despite the advance preparations I had made, the experience contained many elements I couldn’t have predicted. 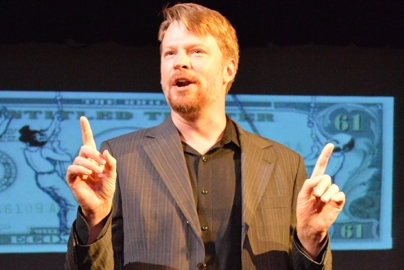 Money Lab proves that theatre and the market are equal in this attribute. I’m young, and I work in theatre, and I came of age in the new millennium, so I think about money all the time. Or, more specifically, I think about my relationship to money all the time—do I have enough (usually not), is what I’m purchasing worth what I’m paying for it (usually not), why don’t I get to decide for myself how much things are worth? Our relationship to money is inherently dramatic, because money (and the lack thereof) is often a cause of conflict. People owe us money, so we argue; we’re in debt, so we worry; we’re generous with our abundance, so we celebrate. The examples of works of art where the source of tension is somehow related to a financial situation are numerous. When I think of money and theatre, I think both of how expensive it is to produce theatre and how poor artists are, and of the plays I’ve seen (and written) where characters’ lives are heavily influenced by external monetary-related factors. Money Lab certainly featured this type of dramatic financial story in the four central performance pieces. Storyteller Trica Milnamow performed a piece about her experience paying for things using layaway, and Lone Wolf Tribe presented a puppet piece entitled “The God Projekt: Tithing,” where the responsibility of giving money to the church drastically impacted the lives of every character. Steve Zimmer shared a story about his time working for The Fed, and the insider experience he was afforded in the world of high finance that, for most of us, exists behind tightly-closed doors. The evening concluded with “I’m Bullish,” a rousing musical number celebrating the optimism when market prices rise (featuring tap dancing bulls). These four pieces offered glimpses into the many ways we relate to money: we’re thrilled when it’s doing what we want it to, we’re depressed when it feels out of our control, and stasis is essentially never achieved. And yet, Money Lab takes the challenge of theatricalizing finances many steps further by asking a second question: we agree that the ways humans relate to money are dramatic, but what about money itself? Does money, a tangible accumulation of dollars and cents, behave in such a way that its very existence is dramatically compelling? Money Lab says that the answer is yes, and sets out to depict this on the small stage in multiple ways. When we arrived, audience members were asked to purchase tokens: red tokens, which could be used to purchase life essentials like food, and blue tokens which could be used to purchase what some argue are non-essentials: art. At the beginning of the evening, both red and blue tokens were valued at 50 cents equally, but throughout the night, mirroring the true capitalist market we live in outside of the theater, the values of each rose and fell. We would check in with the values between performances, and have the opportunity to spend the tokens if we wanted to be rid of them, or purchase more if we thought their value would increase as the night went on; at the end of the night, we were able to trade tokens back in for American dollars, so the investments we were making in the tokens extended beyond the purposes of theatre—if you were smart, you could leave the night having made back the price of your ticket. I’m not going to pretend to have anything beyond a classroom understanding of how prices rise and fall in the market, and the increases and decreases in value throughout the night were so anxiety-inducing that I cannot imagine how so many people spend their days watching the market change and adjust—I’m certainly not cut out for that type of work. The experience at Money Lab hammered in the point that most of us prefer to keep the financial movements out of sight and mind—we think about the money we have and the money we don’t, but by and large we don’t follow the mass market that exists separate from our own personal investments. The evening featured one final dramatic relationship: in addition to exploring how we relate to money and how money relates to itself, it also explored how we relate to each other about money.To explore this, the audience participated in several games throughout the evening. Goods were auctioned off, and a few audience members were invited on stage to play games that would demonstrate their willingness to spend or save their tokens in front of everyone else. These, to me, were always the most exciting moments because we never knew what was going to happen, and the choices people made with their tokens always seemed genuine. In one game, an audience member was instructed to make an offer of their tokens that another participant could either take or leave, or attempt to strike a bargain. I settled in for what I hoped would be a rousing fight for tokens, but something remarkably different happened: the first audience member held up ten tokens and said “This is all of my money, do you want it?” The other audience member, clearly taken aback by the offer, responded “um…sure?” True to her offer the first participant offered all of her tokens, and seemed delighted to do so. This occurrence set a standard of altruism that lasted the entire night, clearly to the shock of the performers. Audience members readily offered up their own tokens to help fellow audience members purchase things they were interested in. At the end of the night, there was to be an auction where the final offer would be given to one of the performers, whose name was pulled from a hat, so that the performer could trade the tokens in for genuine American cash. The auction began in the usual way, but then one audience member realized that if we all pooled together the tokens we didn’t need, we could give the artist more money than one person making the highest offer. The audience stopped the auctioneer in his tracks and elected to combine the money, so to speak, so that ultimately over 100 tokens were combined in order to send the artist home with over $40. It was tremendously fun to participate as a group to surprise the artist, and all of the performers were excited by the generosity. It reminded me that while the market often seems to operate on its own, there is always true power behind a group of people deciding together to enact change. The auctioneer remarked with astonishment that he had never seen such a thing at a Money Lab performance, underlining one of the most exciting aspects of the piece as a whole: no two performances were alike. This is partly due to the individual pieces performed, partly due to how the market behaves, and largely due to the participating audience. What would happen if the audience were made up entirely of business people, bankers, or government officials, rather than theatre fans—would they be as supportive of an artist and pool their funds? If one brave person started the trend, would others follow? What would happen if each token was valued at $100 or $1,000 rather than 50 cents? But Money Lab exists to be a microcosm of a much larger entity. It’s easy to be altruistic when you’re donating a few bucks; it’s harder to be generous when the ask is for thousands of dollars, and you’ll be parting with a much greater percentage of what you have to offer. My lasting impression of Money Lab was just how pervasive finances are both in life and in the theatre. We relate to money, we relate to each other about money, and money continues to engage with itself as values increase and decrease, and this happens day in and day out. Money can be a source of positive feelings and negative ones. While I had fun exploring these narratives, I must admit I left hungry for other narratives, both on stage and in the world at large. If the generosity demonstrated by the audience is any indication, there is tremendous potential for positive financial solutions so that we can worry less about how much money we’re gaining and losing and instead begin engaging with each other in different, more satisfying ways.